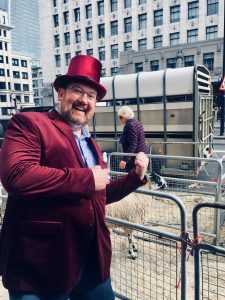 Late last month, I headed back across the Atlantic to visit with our growing customer base in the United Kingdom, as well as spend some time with Tim Davies, the Managing Director of our UK subsidiary. After spending another week visiting customers and attending conferences with him, I continue to be amazed at the depth of understanding of the strategic challenges facing publishers that Tim brings to even the most basic of engagements regarding editorial and composition services. Westchester, along with our clients are exceptionally fortunate to have Tim on board. Our first event of the week together was The Bookseller’s Children’s Conference, held at County Hall in South London in the shadow of the London Eye. 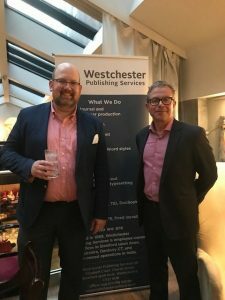 We had meetings scheduled with a number of customers and prospective partners, and were elated with the amount of booth traffic from publishers who had never spoken with us before, wanting to learn more about how Westchester helps their peers. The opening session providing an overview of the industry stats (the state of juvenile publishing remains strong!) was reassuring and encouraging. Of particular interest to us in the sessions that followed were the comparisons between the US and UK markets provided by Hanna Otero (Lonely Planet Kids) and educational publishing luminary Lionel Bender. 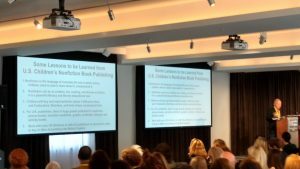 The Lonely Planet perspective largely dealt with how to package content for different markets, whereas the educational session dealt more with the trends in US supplemental educational publishing that could be considered within the British market. The former is of keen interest to Westchester as we do handle global editions for publishers, and the outcomes shared in the educational session bore some attention at our stand during the conference. Educational publishers came to take meetings and discuss the work being done by our stateside “K-12” division, which provides content development, editorial, and design services to US and UK publishers. The Bookseller continues to put together phenomenal conferences for the industry, and we look forward to seeing their staff again at FutureBook in November. In addition to being in town for the Children’s Conference and the monthly BookMachine meeting, Tim and I also had the opportunity to formally celebrate the opening of our UK office in Stratford-upon-Avon. Gathering with some customers, partners, and a few bottles of prosecco, we toasted this milestone in expanding our presence in the UK, and got to continue the week’s trend of meeting with publishers to better understand their particular take on the publishing landscape. While I was in England, I also attended two events with the Stationers’ Company, the UK-based publishing guild that I joined last year. The Stationers’ Company plays an active role in the UK publishing industry, drawing members from all portions of publishing and media, from the paper industry to printers, writers, editors, publishers, typesetters, newspaper journalists, and more. The Sunday after I arrived, the historic Stationers’ Hall was opened to the public for tours as part of Open House London. 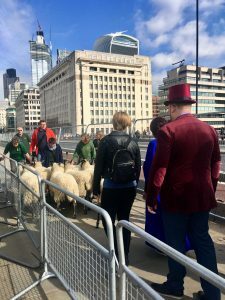 I volunteered to help, providing background about the hall to visitors who wanted to see the architecture or learn more about the Stationers’ as a livery company. The hall itself, built after the great fire, sits upon the prior hall used by the guild, where Shakespeare’s folio had been registered for copyright. While I knew enough of the history and trivia to welcome people into the hall for the Open House, my fellow publishing colleagues gave me even more interesting background about the building, including the fact that the King James Bible had initially been debated in committee in the original hall on that location. 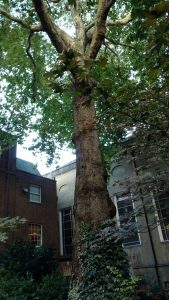 The plane tree in the courtyard is also noted for having been planted on the ashes of burnt, pirated books, accounting for how it is one of the oldest and largest plane trees in London. Are you based in the UK and interested in learning more about how Westchester can help you with your editorial and production needs? Contact us to arrange a discussion at the Frankfurt Book Fair, FutureBook, or at a meeting in between these next two conferences for the Westchester UK team.